For over twenty years, Ken Lum has concerned himself with issues of identity in an exchange economy of increasingly global dimensions. The subject of identity as a difficult to define yet genuinely felt problem has been treated by Lum across various Appadurai-type configurations or "-scapes", primarily domestic, public and ethnoscapes. From early Furniture-Sculptures to Language-Paintings, from Portrait-Logos to Photo-Mirrors, Lum's work has consistently expressed the political and personal eruptions that can emanate from the daily collisions between binary of the individual and the social, particularly as such eruptions traverse the symbols and surfaces of modernity. 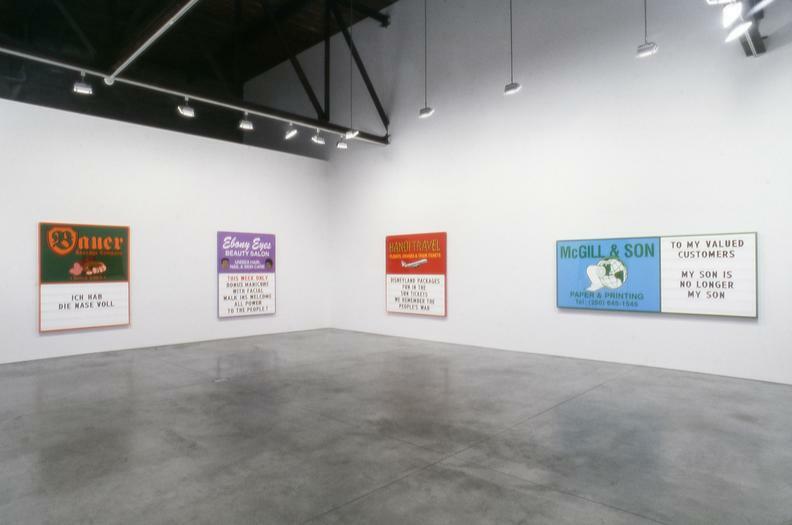 In his new works on display at the Andrea Rosen Gallery, Lum explores the expressive potential inherent within the logic of the commercial sign when bifurcated into two temporally different halves, one half registering permanence relative to a second half that can be regularly "updated". Though absent of photography or any representation corresponding to the conventions of portraiture, these new works can and should be seen as portraitures, continuing a central occupation in the work of Lum since 1978. Here, the portraits are conveyed by the clues offered by the message presented in the sign, information such as occupation and quality of service is offered. The "permanent" half of the sign looks deliberately common, a product of clipart and sign shop nomenclature. Lum is interested in several aspects of such signs, a) they retain some proximity to the idea of a subject--the proprietor of the shop, for example--in difference to signs for much larger or globally marketed companies; b) they are often clumsily and poorly designed thus opening up further their potentialities as dialectical images; and c) the "changeable" half of the sign offers the possibility of violent non-identity with the sign's more permanent half. It should also be remarked that these new works are striated with emotionality from poignant sadness and political reflection to biting humor.